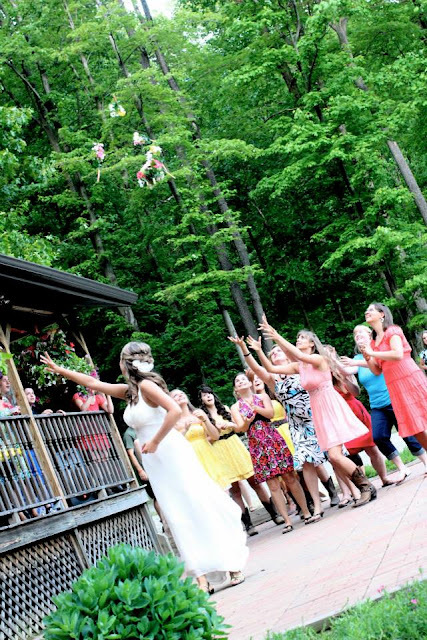 It is said that whom ever wins the catch and the bouquet, is the next in line to get married. All the single ladies at the wedding get ready to catch and compete to get the bouquet, and sometimes it is a knock down drawn out fight to get control of it and win. We made the throwing bouquet to come apart when thrown. We had one larger bouquet in the center, and made 8 smaller bouquets to sit around the larger one in the middle. To anyone looking at the bouquet, it looked normal. We just tied a large ribbon around the base of the bouquet, and as the ladies lined up to compete and catch it, the bride loosened the ribbon that was holding it all together. We did some trial runs at home to make sure it would work, and found that you had to throw it high in the air to make it work and separate correctly. It was fun to see the faces of all the ladies, not sure what was happening, but they were pleasantly surprised, and not one, but 9 people got to take home a part of the bridal bouquet.